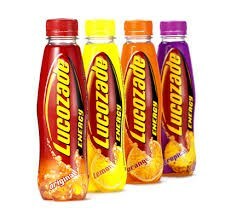 Lucozade is an umbrella name for a series of energy and sports drinks that until 2013 were produced by GlaxoSmithKline. On 9 September 2013, both Lucozade and Ribena were acquired by the Japanese conglomerate Suntory for £1.35 billion. Lucozade (alongside Ribena) is currently being produced at the Royal Forest Factory in Coleford, Gloucestershire, in the Forest of Dean, England.